SymPy v0.7.5 is a a Computer Algebra System (CAS) written in pure Python. 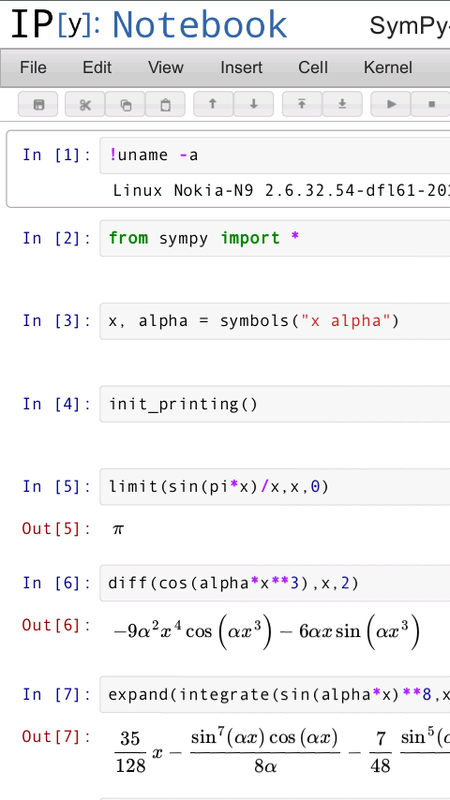 Besides symbolic mathematics (derivatives, integrals, etc), SymPy also allows 2D and 3D plotting if the optional dependency MatPlotLib is installed. See the SymPy.org site and the Talk Maemo.org topic about SymPy for Maemo 4, Maemo 5, MeeGo Harmattan and Mer / Nemo / Sailfish. - SymPy 0.7.3 (14/07/2013) : first release for MeeGo 1.2 Harmattan (05/08/2013).